Fun fact #1: you could receive a scholarship for being in a choir or for being an athlete. Fun fact #2: you could receive a full scholarship to a great school and receive funding to go abroad. Yes, these fun facts are even more fun considering they apply to students who live in West Virginia. There are so many great financial opportunities available to you as a West Virginia resident, and we want to make sure you take advantage of as many as you can. That’s why we created this step-by-step guide to review all of these opportunities. Even if you have not decided which schools to apply to, you should start filling out the FAFSA (also known as the Free Application for Federal Student Aid). The FAFSA is the key for many students to be able to afford college because it qualifies you federal funding. Despite its name, the FAFSA also qualifies your for some forms of state and institutional funding as well. That’s why it’s a smart move to make this the first piece of your college-funding puzzle. However, you might have heard that FAFSA can be difficult to fill out. That’s why we’ve created a free step-by-step guide to completing the FAFSA questions. We’ll walk you through each question (even the trickiest ones!) so you can complete the form as quickly and as easily as possible. After applying for federal funding, you should apply for any state funding that you might be eligible to receive. Even though FAFSA may qualify you for some state funding, some state grants and scholarships require separate applications. Check out the College Foundation of West Virginia's (CFVW) website, which hosts all the state information about financial aid , including scholarships and grants. Here are some West Virginia scholarships and grants that might be applicable to you. West Virginia PROMISE Scholarship is the state’s merit-based financial aid program, which can cover part or full tuition to specific West Virginia institutions. West Virginia Engineering, Science, and Technology Scholarship provides financial assistance to academically strong students to pursue a career in one of these fields. Underwood-Smith Teacher Scholarship gives financial aid to students who are interested in teaching preschool, elementary, middle, or secondary school after college. West Virginia Nursing Scholarship Program provides funding for nursing students in return for working or teaching in the state. West Virginia Higher Education Grant provides funding for students with demonstrated financial need. Remember, scholarships and grants do not need to be repaid. Therefore, you should try to apply to as many as you can in order to reduce your out-of-pocket tuition costs! Once you’ve exhausted your federal and state funding options, your funding search isn’t over. Schedule regular check-ins with your high school guidance counselor. They can often suggest local scholarships that you may be eligible for. You can also search for scholarships online through any number of search engines, such as CollegeScholarships.com (which lists 53 scholarships for WV residents). Try searching by major, extra-curricular activities, nationality, or any other characteristic that sets you apart. It’s also a good idea to look into the specific financial aid programs at each institution you’re interested in. For example, the University of West Virginia is dedicated to making college affordable for residents of West Virginia. Take for example the Foundation Scholarship, which covers the entire cost of tuition plus a one-time study-abroad stipend. Other scholarships such as the Bucklew Scholarship and the Scholarships of Distinction (Levels 1-4)all provide merit-based opportunities. Similarly, the University of Charleston has extensive financial aid opportunities for students. Get this: their Presidential Scholarship grants full tuition to high-achieving students every year. That’s not all they have to offer: the university also gives out merit scholarships, as well as scholarships for being a student ambassador, athlete, or member of the choir. That means you could get funding for simply doing something you love! As you can see, institutions are a valuable resource for scholarships and grants. Be sure to check out the financial aid web pages of every school you are considering. 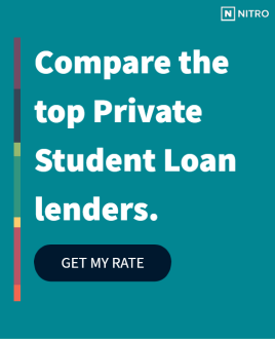 If you’ve completed steps one through three and are still wondering how you will cover the rest of your tuition, it might be time to consider a private student loan. With so many options. it can be difficult to know which lender to use for your loan. That’s why we found the best banks for private student loans to help ensure that you’re not paying more than you need to in order to fund your education. You can also use our NitroScore tool to help map out your financial future. NitroScore will take into account your school, major, financial aid, and loan in order to determine how long it will take you to pay off your education. It will also tell you just how much of your post-college salary may have to go toward loan payments. We know how important it is to be able to pay for college and get your degree. So get excited, you are one step closer to financing your future!